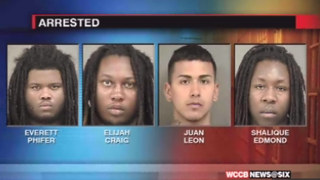 Police arrested four men after a shooting at Johnson C. Smith University in Charlotte, N.C., April 19, 2015, that left one student injured. Police in Charlotte, N.C., arrested four men for a shooting incident that injured one person at Johnson C. Smith University, the Charlotte Observer reports. The four suspects—Everett Phifer, Elijah Craig, Juan Leon and Shalique Edmond—reportedly shot an unidentified male student while he was sitting in a car on the campus of the historically black liberal arts university. He was treated at a local hospital and is expected to be released soon. The shooting happened early Sunday morning during JCSU’s end-of-the-school-year party called the Gym Jam. About 300 people—most of them JCSU students, along with others who came from nearby universities—attended the party. JCSU President Ronald Carter told the Observer that campus security searched partygoers for contraband and weapons before they were allowed to enter. It also denied entry to anyone without a student ID, the Observer reports. At about 1 a.m., security guards turned away the four suspects, who were not students at the university. But they returned one hour later and began shooting randomly into the air. One bullet struck a student in his right shoulder. Officials don’t believe that the suspects targeted the victim. After the shooting, the suspects fled in a vehicle, with campus security and the local police in pursuit. The chase ended when the driver crashed. Authorities seized three guns and marijuana from the wrecked automobile and arrested the suspects, all in their early 20s. Carter said that JCSU is reviewing its security procedures. He doesn’t want this rare act of violence to make the campus uninviting to the larger Charlotte community. “We work hand in hand with our partners in the northwest corridor. We will not allow an isolated incident to change that,” he said, according to the Observer.